We are excited to welcome Sky Bergman as our Guest Speaker for March. Born in Philadelphia, Pennsylvania in 1965, Sky Bergman grew up on the eastern coast of the United States. In order to pursue her passion for the photographic medium, she relocated to California to attend graduate school, attaining an MFA in photography from the University of California at Santa Barbara in 1991. Sky Bergman is currently a free-lance photographer and a professor of photograph and video in the Art & Design program at California Polytechnic State University, San Luis Obispo, where she has been teaching since 1995. 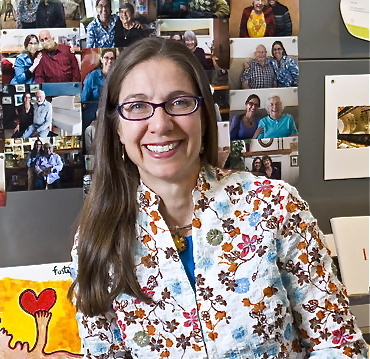 Her recent work includes video in The Lives Well Lived project. What is the definition of a Life Well Lived? She asked forty people aged 75-100 with a collective life experience of 3000 years who shared with us their secrets, wit, and wisdom. The Lives Well Lived project captures the images, ideas and ideals of those who are proving that aging is something to cherish, not dread. That retirement doesn’t mean you retire from life. And that growing older doesn’t mean growing silent. Luncheon cost is $17 and can be paid for in advance by clicking here: Brown Paper Tickets. Please note that you MUST have a lunch reservation by February 29th for this event. All those with a reservation may pay in advance using the above link or at the door. Donations for The Women's Shelter this month are laundry detergent and cleaning products. Please visit The Women's Shelter Donations list for this club year for more details. Our SLO and North County Women's Shelters thank you. And much gratitude to Sharon Peters for heading up this program!